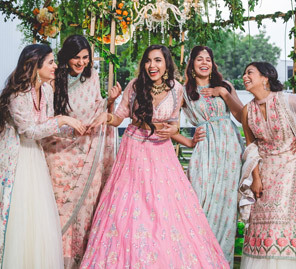 The bollywood actress gives ethnic wear inspiration for fashion-forward bridesmaids this wedding season. 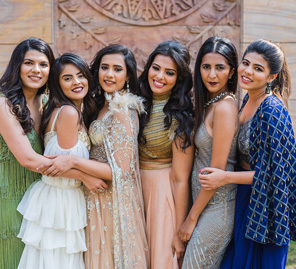 The pretty 'Badrinath ki Dulhaniya' actress has been giving us serious bridesmaid goals from her friends' destination weddings. 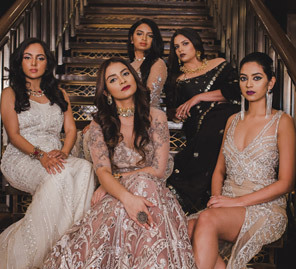 From vibrant lehengas to chic sarees, Alia Bhatt gives fashion-forward bridesmaids some trendy inspiration this season on how to ace the fashionista game at your bestie's wedding. 1. Salmon pink Anamika Khanna lehenga for Sangeet. Loved how Alia draped the dupatta effortlessly like a cape and accessorized with a delicate matha patti. 2. A chic Gauri Nainika dress and hat for brunch. Brush on some lip gloss and nail the flawless skin look. 3. An all-white statement in Manish Malhotra for a reception. 4. A floor-length anarkali by Manish Malhotra in sunshine yellow for a fresh vibe. 5. A classic ivory and red sharara by Abu Jani and Sandeep Khosla for a reception. 6. Alia made a trendy statement in a powder blue and silver Manish Malhotra lehenga teamed with a white cape at Shahid Kapoor's reception. 7. We loved how the young actress dazzled in a silver sequin organza saree by Manish Malhotra at the Ambani wedding party. 8. Our favorite outfit was this grey and lilac lehenga by Koesch worn by Alia at her bestie's wedding. 9. 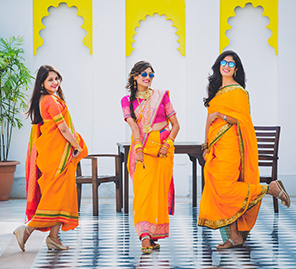 Alia chose an understated silk lehenga by Raw Mango in yellow and emerald for her bestie's engagement party. Loved how she accessorized with minimal jewellery. 10. This sleeveless top and embroidered lehenga in purple was the perfect pick for Masaba's sangeet ceremony. Looking for more bridesmaid inspiration? Click here.